Who Were These Vikings Buried Sitting Upright? Home › Culture › Who Were These Vikings Buried Sitting Upright? Accidentally, in 1963 a burial ground with 24 graves deep inside the bay of Sandvika on the eastern side of the island of Jøa in Central Norway were discovered. The bodies buried in a sitting position is dating back to the years 650 to 1000 AD, and analyzes show that these Vikings have belonged to a very special group of people. Unlike other Viking Age graves, the graveyard was unknown because the bodies were not placed inside a burial mound that is clearly visible in the terrain, or marked in any other way. These dead Vikings were lowered into the cylinder- and funnel-shaped shell sand holes from flat ground. The Sandvika burial ground is unique in Scandinavia, and these people are the only ones found with sitting bodies. The burial custom has been very strenuous: Firstly, the person must have been dead for at least twenty-four hours so that rigor mortis has made it possible to shape the body into a sitting position, and secondly, it must have been very difficult to dig out chairs in the porous shell sand. However, these are not the only reasons why this particular group of Vikings is a mystery. In 14 of the 24 graves there were found skeletons and skeletal remains, 10 graves were empty. Of these, seven women and four men have been identified. Analysis shows that the women reached an average age of 47 years, much higher than average for Iron Age people where the normal life expectancy for women was 39 years. It has only been possible to determine the age of one of the men, and he died at the age of 40. The women had an average height of 157.2 centimeters (5ft 2in), and the men 162.6 centimeters (5ft 4in), which is much lower than the normal height for this period. The men were as much as 10 centimeters (3.9in) lower than the average for the Viking Age (172.6 cm / 5ft 8in) and 12 centimeters (4.7in) lower than people living in the Iron Age (174.7 cm / 5ft 9in). The women do not differ so much – they only were 3.7 centimeters (1.5in) lower than the normal for Iron Age women (160.9 cm / 5ft 3in) and 0.9 centimeters (0.35in) lower than Danish Viking women (158.1 cm / 5ft 3in). The dating of artifacts shows that these Vikings were buried fully clothed in the period 650 – 1000 AD, i.e. from the Merovingian period to the end of the Viking Age, and it seems like the burial custom ended when Christianity was forced with swords upon the Norse society. Today, on the other side of the small river Hovselva (English: the Hof River) is the Hov (Hof) farm located in the northeast – indicating that there was a pagan temple located close to the burial ground. In all of the 24 graves there were found remnants of bonfires, so it is natural to assume that there must have been some kind of ritual that includes bonfire in connection with the funeral. Another peculiarity is that about half the bodies were facing north-northeast (facing the Hof) and half to the south-southeast. No one was facing directly east and only one body was facing directly to the west. As many as ten knifes were found in nine different graves. They vary in length, but none of them has a blade more than 20 centimeters and consequently have not been used as Viking combat weapons. The individuals they belonged to must have used these knives for a very specific purpose. There were no other weapons found inside the graves, which is unusual for the Viking Age. However, there were also found beads, brooches, finger rings and keys, but there is no repeating pattern. Both women and men died at an old age, and the men were much lower than the average height in the Viking Age. They were buried in a small area close to a heathen Hof, and the dead were put down in a sitting position. There was no marking of the graves but they may have been marked with ornamental shrubs or flowers. Almost all of the graves contain remnants of bonfire, and there are no traces of weapons. However, there were found many “regular” cut knives. The bodies were facing north-northeast and south-southeast. No one was facing directly towards the east. Who was this specialist group of Vikings? Was it “hovgydjer”, meaning pagan priestesses – and were the knives used for sacrifice? If so, the theory that Viking Age priests only were women is not correct. Maybe Norse pagan priests also were small men with special “feminine qualities”? Source: Marte Mokkelbost, archaeology thesis: «Sittegravene i Sandvika» (English: «The Sitting Graves in Sandvika»). ‹ What is a Tagaryen Dragon Doing at the Preacher’s Pulpit in Norway? Feminine men certainly is a possibility – didn’t Adam of Bremen write about the priests of Freyr who dressed like women and danced scandalously….? I remember the reference sort of but not the context. fascinating to think about! impossible not to be subjectively projective but i like the idea that they were hermetics, revered if not always comprehended and that just as they were seen to ‘keep watch/intercede’ in this life, it is assumed the people wanted them to continue watching in the afterlife. .
Hello John, my husband is also I-M223. We recently submitted his Y-DNA to FTDNA for the full 111 DYS markers. Why are these people called “vikings” in this article? They seem to have been civilian Norsemen, elderly men and women, unlikely to belong to the viking groups. Hi George, and thank you for commenting on ThorNews. Viking, from Old Norse vīkingr, probably from vīk, sea inlet, “people from the fjords”, were Norse seafarers, warriors and traders speaking Old Norse and following Old Norse Religion, Ásatrú, during the late 8th to late 11th centuries. 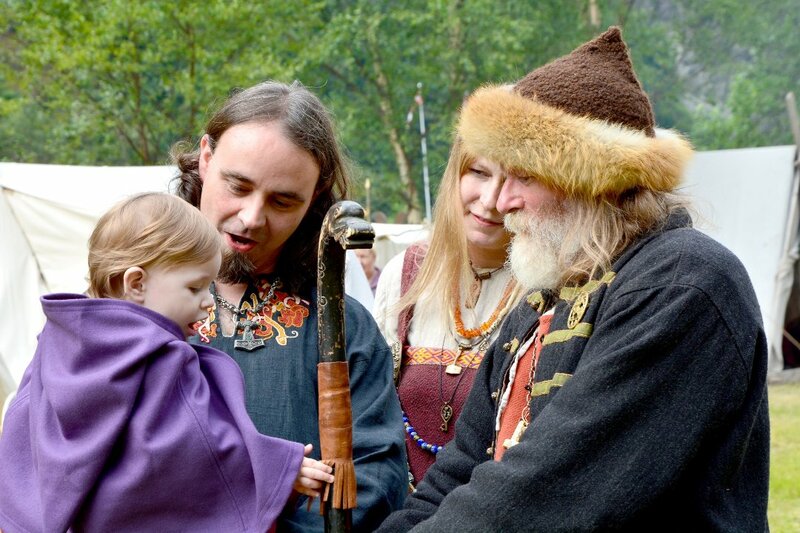 The term is also commonly used in modern English and other languages to the inhabitants of Norway, Sweden and Denmark during what today is known as the Viking Age. Vikings were also called Norsemen, Northmen – “men from the north”. I wrote the thesis that this article is based on. I do not think that these people were Vikings, at least not in the traditional sense. I think rather that they were farmers or specialists, serving under the local chieftain at Hov. One of my conclusions is that the sitting position in the graves could have symbolized their occupation. This area of the country (Namdalen, along the river Namsen) was well known for its boat and ship production in the Late Iron Age. I think these people could have had something to do with the boat or seatrading industry – possibly as oarsmen on local trading vessels. The sitting position could symbolize the oarsman’s position in a boat. The relatively sparse grave goods indicated that the people in Sandvika were not wealthy. They seemed to have old family heirlooms and what we would have called pocketknives (knives for everyday use) buried alongside them. A Viking grave would probably have had more riches, and especially insular items. The term Viking in the archaeological tradition is normally used solely about those that actually went plundering. I think your thesis is excellent; the reason why I did read it two times, word by word, and wrote this article I hope that you got a well-deserved A. If these people were “oarsmen” – there should be thousands of flat ground graves in Scandinavia. Only this one is found. Why? A local tradition only in Jøa? Most unlikely. The same goes for farmers. Was Jøa isolated from the rest of the world? On the contrary: Jøa was a vibrant center in the middle of the “sea fairway” from Central and Northern Norway to the rest of the world, the reasons why there are fond hundreds of Iron Age graves in this area. You also write: “Namdalen, along the river Namsen was well known for its boat and ship production in the Late Iron Age. What about Trondheim and other parts of Norway during the Viking Age? Trondheim (Lade) is famous for its longship production, and there are not found a single sitting grave in the area. Therefore, if your theory is correct – it was only the island of Jøa in Namdalen where people developed a local tradition like this special burial customs with flat ground sitting graves. Fact: The burial mound is located very near a (possible) Norse Hof, and discovered by accident. Is it very unlikely that there are more sitting graves close to other Norse hofs? However, here we have a problem. Only a couple of Norse hofs are fond, and we have never searched actively for other sitting graves. You actually have to “stumble upon them”, as the local farmer did in Jøa in 1963. Have you reflected upon the fact that the “sitting grave people” was buried over a period of 350 years? Orsemen, farmers, “nobody special”? Not very lightly. They are only a few, selected ones. The day we find more Norse heathen hofs, we have to search for more sitting graves, and I am sure we will find more “elderly priestesses and small men”. “A Viking grave would probably have had more riches and especially insular items”, you write. Reminds me of poor Buddhist monks. Is it a fact or a myth that Norse priestesses and priests were rich? Alternatively – did the local population take care of their own priestesses and priests, and did they provide them with food and shelter? Per strict definition, you are correct: “The term Viking in the archaeological tradition is normally used solely about those that actually went plundering”. So, what do you call all the people that stayed back in Scandinavia during the 8th to the 11th centuries, they who did not leave their homeland to plunder? And, what about the tradesmen and explores? Where they Vikings? The Viking Age is fascinating for many reasons, and I think our biggest “modern problem” is that we do not know nearly enough about the Norse culture, and that we only look into hard facts and interpret the findings from our own modern perspective. In reply to your previous comment (I couldn’t find a place to reply to your reply, so I made a new post instead): Thank you for your kind words, I’m very flattered. I’m impressed that you’ve read it through that many times, it’s quite long. What is important to remember about Late Iron Age Norway is that there were no rules that applied to burial customs. Each island, valley, farm or family could choose how they would bury their dead. Wealthy landowners often chose mounds, probably because they wanted to state their ownership to the land. Others, like the people in Sandvika, chose no markings of the graves at all. There were no rules as to how the graves were shaped, and no rules as to how the corpse was treated. Some cremated their dead, other buried them on their backs or sides, while this little group in Sandvika chose to bury their dead in a sitting position. We can only speculate as to why. My thesis presents the option I chose (among several others), and I do not claim that this is the only or correct interpretation. The burial site is so interesting and represent so many questions and interpretations that I could have written a book about it. In the archaeological tradition we can not use inductive reasoning to say that if oarsmen were buried this way in one single place in Norway, all oarsmen must be buried like this all over the country. It’s been 9 years since I submitted this thesis, and I guess I’ve reached some further conclusions since then. It’s hard to remember the difference between what was in my original thesis and which thoughts I’ve had about the material since then. I still apologize that the thought about oarsmen wasn’t discussed in the thesis, I do think I’ve discussed in a later article which isn’t online. I hope to move on with this material soon. I’m not really an expert on Vikings, for that you should read what the excellent archaeologist Anne Stalsberg has written about Vikings. A short article is found here: http://www.adressa.no/meninger/article1445131.ece Most archaeologists agree that the only ones that should be called Vikings, are those that plundered abroad. These were only a small part of the population. The rest would be called farmers, tradesmen, mothers, fathers, sons, daughters etc., according to their role in society. I realize it’s hard to think this way, the Viking phenomenon totally overshadows the everyday life in this period. Were they norwegians? Has anybody made a strontium analysis from the teeth, which would determine the origin of these people? No strontium analyses have yet been made on the remains of these people. I do hope that it will be done in the future. But even though we still don’t have any physical evidence from the bodies, there are no unusual finds from the graves that tell us anything else. I believe these people were local, and at least from what today is called Norway. Thanks for a great blog and a great post. Where is the is two archaeological evidence of oarsmen? Also underline the gender specific in that, in this context there are a number of parallels to look at, the most likely connection may be to a religious function or perception, looking to the grave goods, keys and short knives, this is more domestic in its symbolism, as already noted priests/priestess roles are recorded, and that is a better fit of theoretical model and approach for analysis. Meanwhile directions could be indicative of perceived directions relating not only to spacial division and meaning, but also physical world perceptions, what are the lines to the perceived threats or other that they may be facing. Next sand, a small vertical burial may have a practical reason behind it. Just a thought.